Bacillus pasteurii is one of the more useful bacteria you'll ever meet. 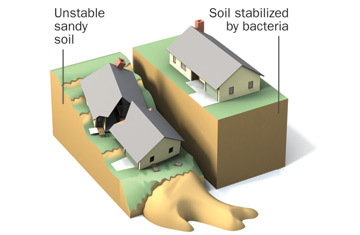 Researchers have discovered a way to use it to turn sandy soil, treacherous during earthquakes, into stable ground. Mix urea, soil and calcium, inject a little bit o' bug and voilà! The cementer bug feeds on urea and deposits calcite, which cements the soil together and turns shifting sand into sandstone.